I’m sure you can agree that when you are deciding on the best tattoo concealer for your needs, performance, ingredients, and ease-of-use are most important criteria to look for. Those were definitely our top criteria for selecting the best tattoo concealer. If you’re ready to get started and “take cover”, Dermablend Professional Cover Crème scored high marks in all categories and is our top pick. Many tattoo concealers often have little in common with each other outside of their ability to conceal tattoos. Each particular product caters to different needs through the use of different ingredients and color tones. Although finding a concealer which has the same tone as your skin is an obvious requirement, you’ll also want to take a few other factors into consideration. For example, while some heavy-duty tattoo concealers may do a better job at completely covering your tattoo, they may also be a little harder on your skin in the long term. How long you want to cover your tattoo also plays a large role in picking out the proper product. While one product may be great at covering your tattoo for months on end, another product may be more suitable for intermittant use. Let’s take a look at three of the best tattoo concealers on the market. Odds are you’ll find that one of these three meets all of your requirements. While this particular Dermablend product isn’t marketed specifically to those who want to cover their tattoos, the Dermablend Professional Cover Crème does a great job for this purpose. The ingredients in the product include mineral oil, talc and beeswax. Generally speaking, these ingredients are quite safe for your skin in the long term and are very unlikely to cause irritation (though you should check the ingredients for yourself, as everyone responds different to any given substance), meaning you can use as much or as little concealer as you want over any length of time. This makes it great for long-term use, unlike some concealers which are rather “heavy” in nature, making them not so great when they’re applied to your skin every day for the rest of your life. If you’re looking for something to cover up your tattoo indefinitely but aren’t quite ready to go under the laser, the Dermablend Professional Cover Crème is just what you need. The Kat Von D Lock-It Tattoo Concealer is more of a middle-of-the-road concealer, being that it’s not the most heavy-duty product. However, it’s still not the lightest concealer on the market. Some of its main ingredients are glycerin, dimethicone and phenyl trimethicone. Some of these names may sound a little scary if you’re the type who prefers natural ingredients, but it should be noted that there is no evidence which suggests that you should be worried about applying this product to your skin. 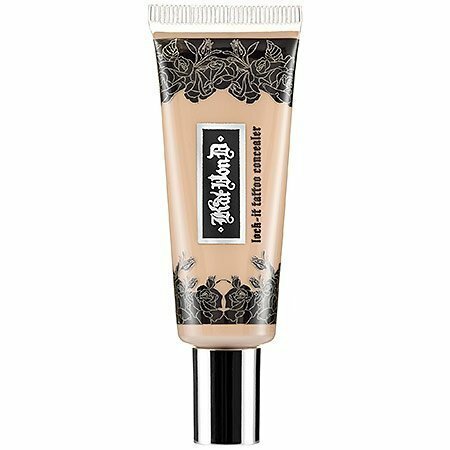 What makes the Kat Von D Lock-It Tattoo Concealer so great is the amount of leeway it gives you in terms of how much concealing you need. Whether you’re trying to cover up a light-pink tattoo or an obvious, out-in-the-open tattoo, you’ll be able to apply just the right amount of the concealer to achieve what you’re looking for. This allows you to save money through not having to use more than you need while still getting the coverage you’re looking for in the end. The customization potential here is high. Made with lots of silicon and vitamins, you’ll likely find the Laura Geller Real Deal Concealer to not only be great at covering up tattoos, but at acting as a health product of sorts. If you’re the type to apply vitamin E oil or similar topical solutions to your skin for long-term care, this particular concealer may allow you to cut down on the amount of skin products you find yourself buying on a monthly basis. While this may not be the most important factor to consider when buying concealer, it’s certainly a nice bonus. What’s interesting about the Laura Geller Real Deal Concealer is that it uses absolutely no oil in favor of a silicon-based solution. Whether this is a great thing or completely meaningless all comes down to your own skin and how it reacts to different substances. If you know that there will be trouble after having your skin come in contact with oil of any sort, the advantage of using this particular product is quite obvious. Otherwise, it still proves to be a great concealer through its mild-yet-effective ingredients as well as its vitamin-rich formula; a trait which carries its own variety of benefits. While all of the above products serve the same purpose in what we’re trying to achieve – the concealment of tattoos – each one is made with a different person in mind. Which one is right for you is dependent on two main factors; what types of substances your skin best responds to and how much concealer you need to cover up your tattoo in the first place. Although any of the three concealers will certainly work to at least some degree or another, getting the right product for you is key. For simplicity’s sake, I’ll recap the above information. 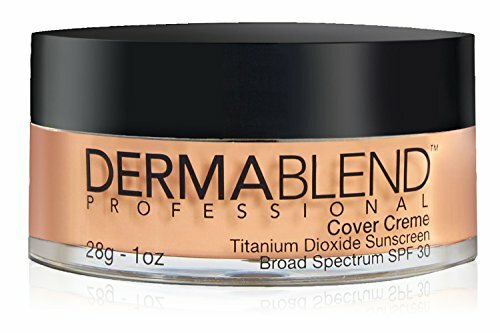 If you need a generic concealer which you can feel safe applying to your skin for lengthy periods of time, the Dermablend Professional Cover Crème is likely just what you need. It has no fancy features about it, meaning every dollar you put into the product will pay off in the end. If you have a variety of tattoos, each with their own concealer needs, the Kat Von D Lock-It gives you the customization potential you need to properly cover each tattoo without going overboard. If you don’t like oil touching your skin or are the type to constantly treat your skin with a variety of topical solutions, the Laura Geller Real Deal Concealer will prove to be an excellent choice. What is a Tattoo Concealer? When first deciding to get a tattoo, you likely spent weeks, months are even years planning the tattoo out in the first place. Through deciding on the design you want, the different colors you want and where you want to go to get the tattoo done, it’s not at all uncommon to take your time going through the process. And why wouldn’t you? After all, this is something that’s going to be visible on your skin to those around you. Of course, taking the time to plan things out will help ensure you project to the world what you want to project to the world. Using this logic, it’s hard not to feel the same way about tattoo concealer. After all, much like the tattoo you’re trying to conceal in the first place, the concealer you pick out is responsible for having you look the way you want to look. Whether you’re trying to land a job, are visiting pesky family member who don’t exactly approve of this modern form of art or simply no longer like your tattoo, tattoo concealer can make the problem disappear. Of course, this is only true if you get the right tattoo concealer. In this review, you’ll see three different tattoo concealers which are great at doing their job. If they don’t seem like they’re what you’re looking for, we’ll go over many of the different characteristics found in different tattoo concealers so you can decide which product is best able to tackle your needs. Of course, while the above three products could easily be considered as being the best in their sector, there are a variety of different concealers to choose from. If you’d like to go out and do your own shopping, keep the following considerations in mind to make sure you walk away with the right product the first time. How often will you be applying concealer? If you know you’ll only be using your concealer once in a while (such as for a job interview or a formal event of sorts), you can get away with using more heavy-duty products with rougher ingredients. On the other hand, if you plan on using it every day, you’ll want to get a lighter concealer. How many tattoos do you need to cover up? Generally speaking, some tattoos will be harder to cover up than others. While you could simply get a multitude of different concealers to compensate for this, a customizable concealer can act as a great, one-size-fits-all solution. Know what ingredients work for you? When it comes to skin products, many ingredients (though not all) are often neither good nor bad. Usually, it all comes down to how your skin reacts to different substances. Take a look at the ingredients on any concealer before you buy it. Will they be compatible with your skin or will they merely serve to irritate it? While every tattoo concealer aims to cover up tattoos, the degree to which any given product will actually do so often varies on the ingredients used within it. Here are the main different types of concealer you can expect to look out for when shopping. Heavy-Duty Concealer – Heavy-duty concealer is not an official term. Rather, I refer to concealers with certain ingredients which are known for being rough on the skin. Typically, these ingredients are present for a perfectly good reason; the CEO of a makeup company doesn’t have it out for your skin. As such, you can expect such concealers to be more effective, though perhaps more irritating after regular use. These are best suited toward irregular use. Light Concealer – The opposite of heavy-duty concealer. While perhaps not as effective in every situation, it proves to be less irritating (usually not irritating at all) over long periods of heavy use. Note: just because a concealer has “light” in its name does not mean it fits into this category; “light” can also refer to skin tone. Customizable Concealer – The product’s effectiveness varies depending on how much you use. The more you use, the more heavy-duty it feels. Vitamin-Enriched Concealer – A concealer made in part with vitamins (such as vitamin E) for added skin benefits outside of its primary purpose. Which tattoo concealer is best for you will vary depending on your own skin. As such, one feature which may work great for somebody else may prove to be a large burden to you. There are; however, a few features which can only do good. Here are those features. Vitamin Enrichment – I’ll say from the start that this feature is not necessary. However, it carries a few pros and no cons, which makes it a nice added bonus to any sort of beauty product. Customization Potential – Once again, this is not mandatory. It will; however, increase the odds that the concealer you buy will work for you. Too light? Apply some more. Too dark? Simply scrape some off. A Clear Ingredient List – Whether you prefer natural ingredients, oils, vitamins or silicone, you need to know what’s in your concealer. Getting the wrong ingredients can actually be counterproductive and can leave you disappointed. If you can’t find a product’s ingredients through its Amazon page or through a simple Google search, you might be better off going with another brand. While such brands won’t always have harmful ingredients, you’re better off knowing what you’re putting on your skin. While there are a wide variety of different features which set one concealer apart from another, in the end, it all boils down to ingredients. If you know silicone always works for you, get something with silicone. If you like what vitamin E does to your skin, get some vitamin E. After looking at the list of ingredients, the second most important factor to consider is whether you need a heavy-duty or a light product. As a general rule of thumb, you’re better off going lighter than need be over getting something too heavy. Keep these considerations in mind when looking for your next concealer to keep your shopping easy, your tattoo invisible and your skin healthy all the while.